I am just loving my new AMC gourmet cookware units! I prepared the mince, covered the pan with foil and popped it straight into the oven! Heat oil in a thick bottomed pot. Add the cinnamon stick and bay leaves. When the spices are fragrant, add the cloves, cardamom pods and cumin seeds. Saute until the seeds begin to splutter and then add the chopped onion. Stir the salt into the onions and saute until the onions are light golden brown. Stir for a few seconds and then stir in the mixed masala. Mix the masala with the onions taking care not to burn the spices. Stir in the lamb mince and continue stir frying. Use the back of a spoon to break down the lumps in the mince. Stir the mince until browned and then stir in the curry leaves. Remove the cardamom pods from the mince. Place the mince in a casserole dish and then scatter the frozen peas over. Layer the cooked rice over the peas and pour the melted butter over. Pour the boiling water over the rice and then cover with foil. Bake in a preheated oven at 180 degrees for 30 minutes or until the rice has steamed through. Heat a skillet and then pour in a little sunflower oil. Saute the mushrooms in batches until golden brown. Season the mushrooms with salt. 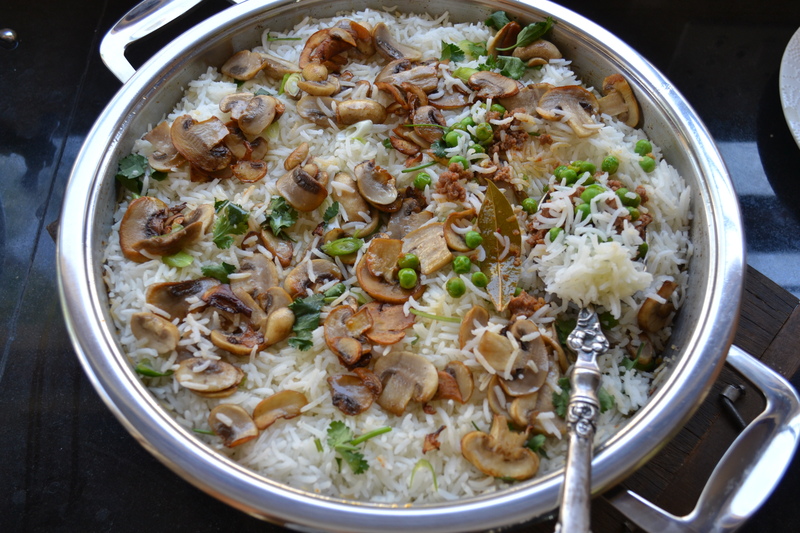 Layer the cooked mushrooms over the rice. Garnish with sliced spring onion and coriander. The cooked rice must be cold for this recipe. I use an AMC gourmet cookware unit which can be used from the stove top to the oven. Cook the mushrooms in batches to prevent them from stewing in the pan. Cooked brown lentils can be used instead of frozen peas.